LTA’s latest release on COE Quotas has gotten Singaporeans at the very best sitting up at attention and at worst in silent seething anger with its wild declaration to cut vehicle population growth to a big fat zero from February 2018 onwards with a review of the vehicle growth rate due 2020. Does this make sense? In all honesty, this creates a lot of uncertainty that leaves us stumped. 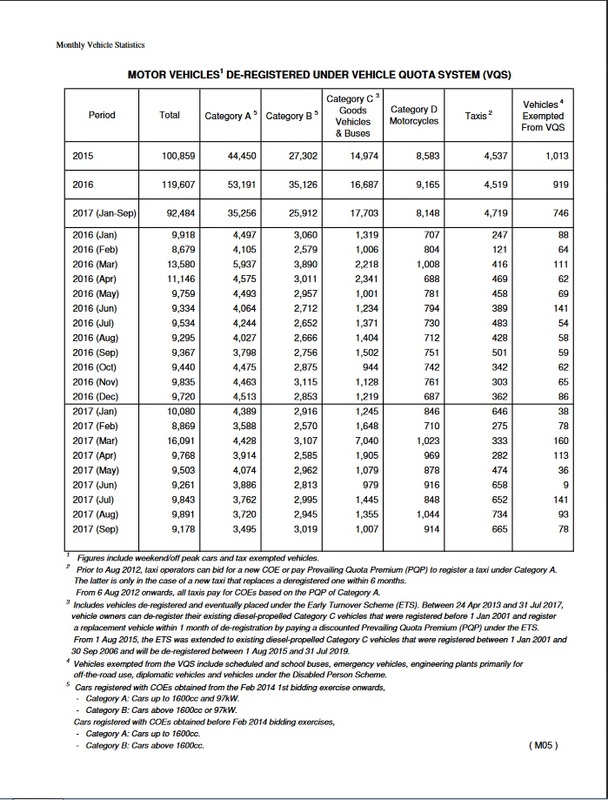 LTA’s figures can be somewhat puzzling at first glance but let’s try to make sense of it based on our immediate concerns. Well, we do know that motorcycle prices have been going up the past few years. Reason being inflation, progressive wages at the factories and dealerships, rising costs of raw materials, taxes including the very targeted ARF for premium motorcycles and of course, COE. A Harley-Davidson Sportster Iron 883 was below the SGD $25K threshold before 2015 – This used to be the lowest priced entry into the Harley-Davidson family. It is now above SGD $25K but thankfully below SGD $30K. For now. Can we expect them to cost more? In line with the reasons mentioned above, yes. But what with a lower COE quota? 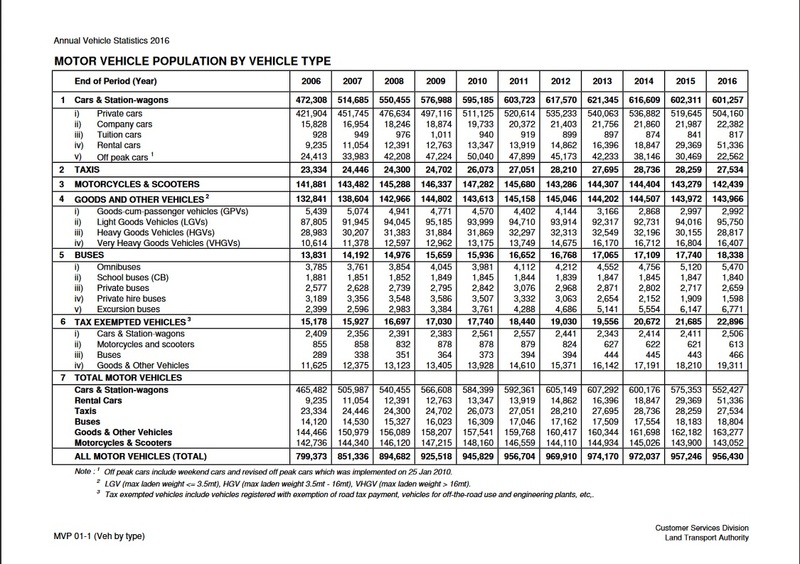 Figures in Singapore’s Motor Vehicle Population Stats show a steady decline in the number of motorcycles and scooters on the roads up til 2016. Hence we can assume higher de-registration than registration figures. This assumption is true, as shown in the LTA Motorcycle De-registration Stats. Let’s once again assume rising COE prices are the immediate cause, while other costs as mentioned previously form contributing factors. With lesser motorcycle registrations, will prices continue to rise? Should the demand remain the same then unfortunately, yes. Simply because COE prices are tagged to demand. While the numbers are decreasing, there is still demand for new motorcycles and premium ones too. (Healthy or unhealthy demand would depend on whether you ask a dealer or a government representative). With the supply expected to plateau with zero growth, should the demand remain the same, we can expect COE prices to increase accordingly. 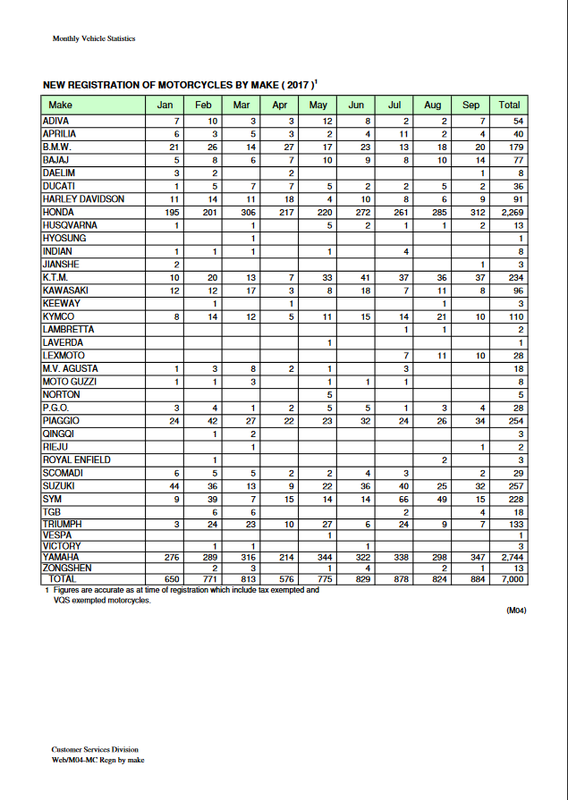 You can track the COE demand/supply/prices here. But here’s something interesting to note. Should the demand shift from buying a new motorcycle to holding on to a current one, renewing COEs will be the new in thing, which means less demand for new COEs, which means lower Prevailing Quota Premiums, aka the price you pay to renew a COE. If renewals are favoured, then we should see COE prices fall steadily but a barrier remain in place to prevent surges in registrations and COE premiums accordingly. If the Premium Motorcycle Dealers are Selling Less, Where is the Demand? 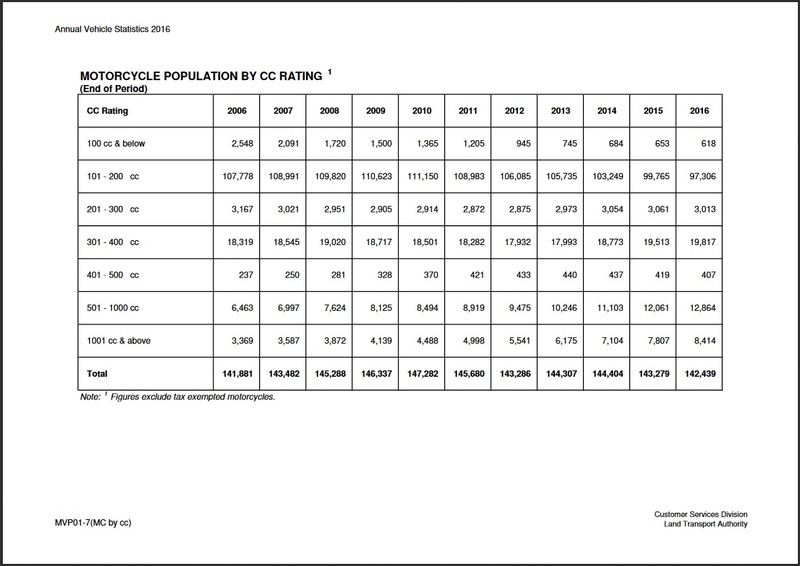 Simple, a little bit of searching brings LTA’s Motorcycle Population by CC figures. From the start, the reason to revise ARF in February 2018 was that COE quotas should be kept for motorcycles for the commuters and workmen. How? By making the premium motorcycles across the board more expensive. It pains me in saying this, since I love my motorcycles and admittedly, the fun is in the machines from 500cc and above, where the reason for transport becomes intertwined with the idea that commuting should be fun, engaging, enjoyable, and everything positive or that a commuter should also encompass other functions for riding. Hence I can’t deny, LTA’s reason push their prices up was truly in favour of the small guys. Can We Expect Panic Buying? Most probably but funny enough, we didn’t see any spikes in sales back in February, probably also due to the COE prices dampening the spirit of buying. Who Then Benefits The Most Out Of This? Clearly the ones with inventory and no need to register new vehicles. Who? The used motorcycle dealers of course! Ready stock and no need to register or bid for COEs rules in their favour. Some shifty and ENTERPRISING shops will of course try to leverage on this newly rekindled source of demand and we can expect to see spikes in prices for used machines, though service history will be a grey area. This 1-for-1 COE pool will also place great dependance on how many old machines these dealers may decide to scrap. I’d like to encourage potential buyers to know their lemon law prior to save themselves from bad deals with dealers looking to make a quick dollar. I still remember my experience with a particularly nasty sales team over a used motorcycle I bought. We were literally standing outside the shop shouting at each other, stemming from poor sales ethics. Know your machines and what to look for before buying a used motorcycle! (I should write a piece on that soon!). Apart from having to cough up more for their dream motorcycles and gnashing teeth, consumers will also have to be more informed since used machines will be the order of the day and being able to perform self-maintenance will be a crucial skill except for the time-strapped. Prevailing Quota Premiums might possibly come down since technically there is no longer any point to bid excessively. Will I Still Be Able To Buy A Motorcycle From A Dealership? See things differently? Was there a point missed here? Bring it up, leave a comment, or start a discussion.